A steam pipe explosion in New York City sent muck, steam, and asphalt into the air. Electric company ConEd is testing for asbestos contamination. Asbestos is a fibrous, mineral-based building material that is toxic to humans when inhaled. It is linked to lung cancer . On Thursday, a steam pipe exploded on 5th Avenue in New York City, spewing muck, steam, and asphalt into the air. The incident also generated fears of asbestos contamination. “Environmental testing is being conducted to determine whether asbestos or other contaminants are present, but as a precaution anyone in the vicinity of the rupture who was covered in material is advised to bag their clothing and shower,” electric companyConEd said in a statement on Twitter. The fire department confirmed the possibility of asbestos being released in the explosion. “We’re operating with an abundance of caution since this steam main was installed in 1932, so there is possibly a presence of asbestos. Samples have been taken and we’re awaiting the lab results. We are operating as though those samples will come back positive,” FDNY Commissioner Daniel A. Nigro said in a statement on Facebook. 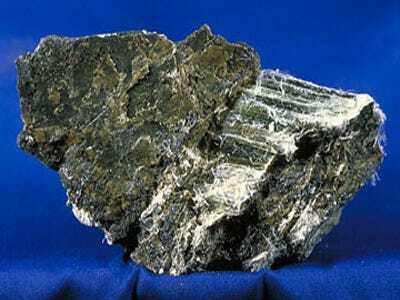 Mined in different white, blue, brown and green shades, asbestos is a naturally-occurring silicate mineral that is composed of long, thin crystals, which can kind of look like a fibrous blanket. Asbestos was used as a building material for years before it was linked to lung problems. The dust from asbestos can be toxic when we inhale it, and loose asbestos fibers should be avoided. In the late 1800s, people began noticing that asbestos miners in the UK were dying off at alarming rates, a first warning sign that inhaling the dust from asbestos could be deadly dangerous. The fibers have been useful in all kinds of construction, “due to their extraordinary tensile strength, poor heat conduction, and relative resistance to chemical attack,” the World Health Organization explains. For a long time, asbestos was used in insulation, water supply lines, roof shingles, break pads, and numerous other products. “The reality is that anybody brought up in the 1960s has probably been exposed, at some point, to asbestos,” cancer researcher Paul Pharoah from Cambridge University recently told Business Insider. If asbestos contamination is confirmed in New York, the entire area around the explosion will need to be decontaminated, and parts of 5th Avenue could be shut down for days, a city official told The New York Times . Products that contain asbestos are not completely banned in the US today , though the Environmental Protection Agency regulates their use. But governments in other countries have completely banned the use of asbestos. The World Health Organization says definitively that all forms of asbestos are carcinogenic to humans, and causes cancer in the lungs, larynx, ovaries, as well as many cases of mesothelioma.